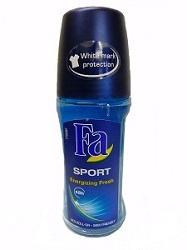 Fa Deo Roll-on Sport has a sporty freshness that comes from its aromatic woody fragrance. It vitalizes and activates the body and mind. The quick dry formula gives 48 hour protection against body odor. The formula is mild and cares for and protects the skin. Skin compatility has been dermatologically established.